Hello, everyone, and welcome to this week’s episode of the unSeminary podcast. Today we have a two for one special with guests, Clayton Hentzel and Ben Ellefritz of The Crossing Church. The Crossing has 10 locations in four different states across the Midwest. Clayton has been a part of the church for about 12 years, since he graduated from bible college. He started as youth pastor and now works as a multisite executive pastor and campus pastor at the Macomb location. Ben has also been a part of The Crossing for a long time and works as assistant executive pastor at the Macomb location. One of the first things you’ll hear if you visit The Crossing is “we exist to help you find a personal relationship with Jesus.” That is the foundation of the church and what they build upon. 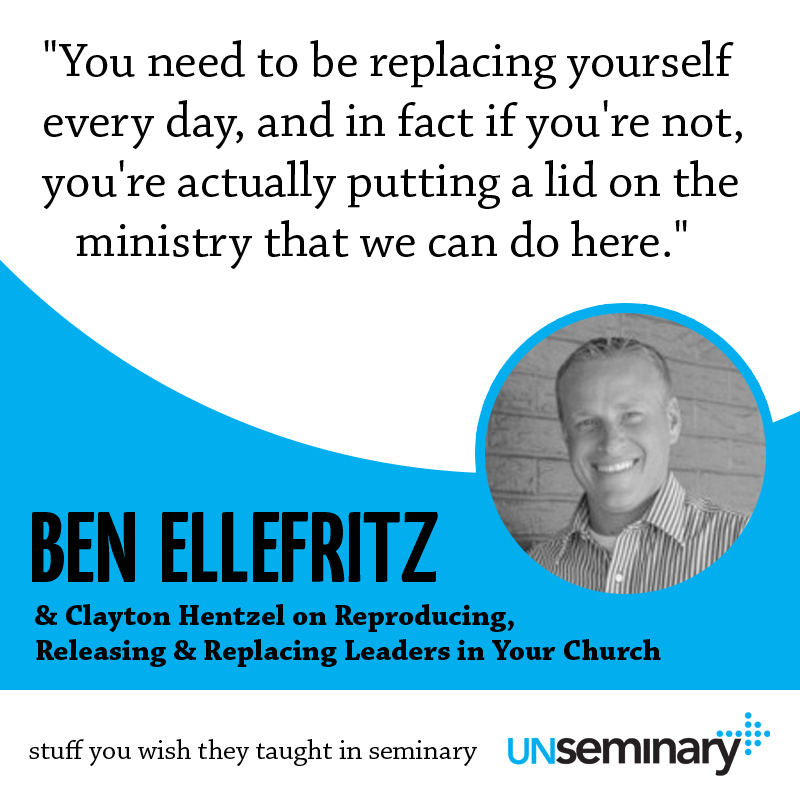 Today Ben and Clayton talk to us about creating a plan to raise up the next generation of leaders in your church. Change is never easy, but it’s worth it. // It can be difficult to hand over your role and let someone else take over your work. “Culture change isn’t fast and it isn’t easy,” Clayton says. Ask yourself if you believe that what you do is the best and most effective work for the advancement for the kingdom of God. If yes, then give other people the chance to have that fulfillment in their lives too. Many people don’t feel like they’ve made a difference in the world or even another person’s life. Working for the kingdom of God gives people that chance to make a difference, even if it’s only at a local level. “You will do infinitely more ministry through people than you will ever do by yourself,” Clayton adds. So though it’s difficult to hand over your role and let someone else do things their way, give someone that chance to experience the joy you’ve had serving God and his people. Letting go allows you to make a difference in another’s life and then they can make a difference in other people’s lives too, pushing the ministry forward. Practice giving up the reins. // At The Crossing, they had a weekend called “Our Difference Maker Weekend.” During this time, all of the staff became just attendees. No staff were on stage, no staff led any classes or ministry, or even greeted at the door. This event made the staff members really think about how to prepare the individuals that would be covering their roles. By handing over the reins for a day, they were able to sit back and see how it all worked from a different vantage point. This choice can cause a lot of nervousness, as it did at The Crossing, but it gives staff a chance to see how well they’ve prepared the next generation of leaders. This event went incredibly well at The Crossing and it’s possible at your church too. “You cannot equip someone if you’re in their way,” Clayton emphasizes. Practice turning over the church to the next generation of leaders you’re raising up, and let them show you what they can do. You can learn more about The Crossing at www.thecrossing.net and you can find contact information for Clayton and Ben there. 00:46 // Rich welcomes us to the show. 01:13 // Clayton Hentzel introduces himself. 02:20 // Ben Ellefritz introduces himself. 03:02 // Ben gives us a flavor of the ministry at The Crossing. 04:17 // Clayton talks about raising up leaders. 07:31 // Ben talks about succession planning. 09:18 // Clayton talks about the impact of culture change. 12:15 // Clayton gives us examples of the impact of great volunteers. 14:04 // Ben and Clayton both talk about the Difference Maker Weekend. 19:19 // Rich talks about a similar scenario at Crossroads Church. 20:54 // Ben shares a positive result from the Difference Maker Weekend. Rich – Well hey everybody, welcome to the unSeminary podcast. My name’s Rich, the host around these parts, I’m so glad that you’ve decided to join us today. We like to bring on guests on a regular basis to help us think through some of those issues that are impacting your church and today you’ve got a two for one special which should be a fun day today. We’ve got leaders from The Crossing, this is a fantastic church, which actually, I believe you have ten locations across the Midwest in four different states, is that true? Rich – Wow, that’s amazing. This is a fantastic church, if you haven’t plugged in and learned more about The Crossing, you really should. So I’m going to let you introduce yourselves and why don’t we jump through? Tell us about your role, tell us about the church, give is a flavor for what’s going on at The Crossing. Clayton – And I said yes and came up here and started this location which is in McCalla, a town of about 12 thousand people with about 8 thousand college kids and I’ve been doing that here. Then over time, started helping to oversee our other locations while still at this location, but then by the grace of God, we got lucky is our get out, and we found a guy who’s now a great friend and a partner in ministry, Mr. Ben Ellefritz and I’m going to let you hear a little bit about him. Ben – Yeah, like he said, I’m Ben Ellefritz and I’ve always been a part of The Crossing, I’ve kind of had a different journey to get where we’re at. I was actually an elder at a church that now is a Crossing location. So I’ve grown up with guys like Clayton and some of the other guys that are working at The Crossing. So it was a transition from being an elder at a church that was acquired by The Crossing, to being a high caliber volunteer whilst I was a principal in schools for a decade and now being on staff and being a part of a great team at The Crossing and specifically in the McCalla location. Rich – Nice, very cool. Why don’t you give us a flavor Ben of kind of the ministry of The Crossing? If people were to come this weekend what would they experience, what’s the church like? Ben – Well there’s a few things that are just embedded in our DNA at The Crossing. One of the things you’ll hear from the second you get in is, “We exist to help people find an intimate personal relationship with Jesus,” and that is just what our foundation looks like and what we build upon and I think that’s what sets The Crossing apart from a lot of other churches, that is our goal. It’s not about showing up on Sunday, it’s not about coming to a building, it’s literally about helping people find that relationship. So with that comes parts of ministry that become interesting, because when you open your doors to anybody and everybody, you have to be careful what you ask for, there’s some work that goes into that. Ben – But no greater reward than what goes into that. So just seeing The Crossing as a whole, I mean people that drive miles just to be part of our church and being spread out like we are, we definitely have an opportunity to have a great impact on the Midwest, just because of The Crossing brand and helping people find that relationship that changes their life forever. Rich – Very cool. Well Clayton, you know, raising up leaders must be a real issue in a church like The Crossing. As you’ve multiplied new campuses, even as your campus has grown, that’s got to be a complex piece of what you’re dealing with. Can you give us a sense of, how do you think about raising up and then releasing leaders at The Crossing? Clayton – Well what’s kind of happened at The Crossing is, we do mega church ministry in miniature towns. So we have like, if we’re lucky, our Walmart in the town that we’re putting a location in. So for us to go out and hire people and get them to move to where we do ministry is basically impossible. There’s no chilies in any of our locations, there’s no [Inaudible 00:04:49] way in any of our locations, there’s no target in any of our locations, we are in cornfields. A long time ago we got connected with a church out in Post Falls in Idaho called Real Life Ministries, and he was talking about the difference between a high school coach and a football coach and a college coach and a high school coach has to win with the players in his community. A college coach gets to recruit people from all over the states and then of course, the NFL, they get to pick who they want and pay them exorbitant amounts of money. Rich – That’s a great distinction, that’s a great word picture, just to kind of pull apart in people’s brains, the difference between a high school coach and a college coach. I appreciate that, sorry to interrupt, keep going. Clayton – No you’re fine. So we begin to double-down. We realize that as time’s moved on that money was not going to be our biggest challenge, although because we do ministry at a very effective rate, but we’re able to get buildings for almost nothing now. A lot of those things have moved, the hurdle was, “Who’s going to be the person? We could take a town for Jesus if we had a team?” The way we have to do that though is you have to have a pipeline and that pipeline has to be so unbelievably packed full of people so that it can keep up with the vision and keep up with the opportunities. So specifically here at the McCalla campus, but a lot of our other locations do a great job with this, I wouldn’t say we doubled-down, we quadrupled-down in the area of raising people up and that was kind of forced because we really came to grips with the fact that I’m not going to be the pastor of McCalla a hundred years from now, somebody else will take my spot, so why don’t I start raising up somebody now? That’s kind of how it started for us. Rich – Yeah absolutely. You know, [Inaudible 00:07:03] says, “Every pastorate is an interim position,” you know, we all received this ministry from someone else and we’re going to pass it onto someone else, even if it’s an interim ministry for 20 or 30 years, it’s still interim, someone else is going to take this ball and run with it and we’ve got to really develop a plan for that. Maybe Ben, you could kind of talk about, what has that looked like practically at your campus? How have you begun to kind of develop a plan around raising up leaders? Clayton, even pushing some of that, I would imagine, even in myself now, that raises some internal questions that maybe raises a bit of pain in my life around, “Gosh, I’m not sure I want to hand over what I’m doing, I kind of find a bit of comfort in what I’m leading.” Is just everybody at The Crossing, they’re just all benevolent people that want to raise up other folks around them? Clayton – No, no. We’re talking about culture changing. Culture change isn’t fast and it’s never easy. I think Rick Warren or Don Wilson said, “There’s no growth without change, no change without loss, no loss without pain.” So we’ve kind of embraced the hurt that comes with this. This is something your podcast people probably should know. I’m 33, Ben’s 36 and we are in a constant state of working on who’s going to replace us. We’re not having this conversation at 50, we’re not having this conversation at 45, we’re having this in our 30’s, because we believe in it. There are people who are putting handles on buckets all day long and at the end of the day, when they go home from work, they don’t feel like they made the world a better place or that they made a difference in a person’s life. We have that outlet by being ambassadors for Christ. We have an opportunity to be world changers, even if it’s only at a local level, because you’re changing somebody’s world and we want to capitalize on that. And for people to see that your value at this church is now, not in what you can do but in how many people you can raise up, because you will do infinitely more ministry through people than you’ll ever do by yourself. Rich – So true. You know, I think one of the things I love that you’re hitting on, which is a shift for church leaders that are wanting to make an impact in their community and it’s really a two-part, I just want to kind of pull it apart a little bit for folks. I think sometimes we pull back from asking people to volunteer, we say no for them, even in the way we ask them, we’ve diminished what they’re going to do, and ultimately what that does is diminish the impact that they’re going to have and diminishes the growth that’s going to happen in their lives. We don’t need people to serve in our ministry, people need to serve in our ministry for their own growth, for their own development. Do you have a story, do either of you have a story of an individual in your church who you’ve seen that? They may have, like you say, they’re putting handles on buckets all day long, but they really come to life in your ministry, they’ve really become, really who God’s called them to be through your ministry? Clayton – I’ll give you one. We have a guy, he’s the trash man and he’s rough around the edges, he’s a riot but he’s at three services a weekend as a part of our security team, and wouldn’t miss it. We’ve got a guy who’s a banker by day and he can’t wait for an opportunity to teach a Belong Class, or just this week he shared his testimony about tithing that people are finding their significance and their place, not just in the spiritual world but in this world. We’ve got another banker friend who’s our age, who leads worship for us on a pretty regular basis and stepped up as our intern worship guy during a time when we had just actually sent a worship leader from our location out to go and start a new location and we were going to backfill with a worship leader here and we went six months without a worship person and it was all volunteer people. We had a staff member help out, but it was all volunteer and that gives you incredible strength as an organization to have people that committed that you don’t have to be paying out all the time to be able to accomplish great ministry. Rich – Very cool. Now I think there are a lot of leaders, maybe senior leaders who are listening in today who are like, “Yes, yes, yes, I want to get my people to release their people, but it just isn’t working for whatever reason. We talk about it, it’s in our heads,” but you guys have been able to actually operationalize it, it’s actually working. What did you do? Was there any kind of point in time, maybe Ben, where things actually flipped, or it was like it went from like, “That’s an interesting idea,” to actually getting something done? Rich – Okay, wait a second here. This is crazy, you’re talking crazy talk Clayton. Where did you come up with this idea? Tell us about a bit of the impact and there’s got to be some pain associated with this somewhere. Clayton – But what they don’t realize is that puts a lid on future growth because I want everybody on staff here to get sent out to go and launch another location and I can backfill with the people they’ve raised up at this location, and we’ve done that with two locations. We sent three people from our staff to start a location 45 minutes away and then we sent our worship leader and his wife all the way to start a location six hours away. But when we put the date on the calendar it got real for everybody, because they knew, I mean we’re at satellite locations, so you’ve got to take a feed, someone’s got to land the plane and do the invitation at the end, leading worship, sign people in, security, opening the doors, locking the doors after. I mean, we literally, staff were not allowed to do anything. You couldn’t fix the problem. If our feed went down, a volunteer had to preach the sermon, that’s not a manuscript sermon, there’s nothing to read, you’ve got to handle it. Clayton – It forced everybody to really evaluate who they’re investing in, how committed are the people they’re investing in, how well have they trained them and it went incredible. Clayton – And that’s exactly right. Then at the very end, one of our Difference Makers got up and he said, “I want you to know, this whole weekend was brought to you by us. We’re The Crossing Church, and our whole staff could have been off launching another location someplace else because we’ve got this,” and the church went nuts, clapping and they embraced what it was. I think there’s a part that, “I want to show how valuable I am to my congregation, so they appreciate me, so I always have to be the one doing all the stuff.” This is the exact opposite. The bible teaches this over and over again, our job is to equip people for acts of service. You cannot equip somebody if you are in their way and so we just stepped all the way out. Clayton – And we’re going to do it again. Rich – Oh you are? Nice. You’re going to repeat it? Clayton – I want this to be… We want this to become culture. I would love for us to, on a regular basis, maybe three or four times a year, turn it over to all of our people. Clayton – I mean, you can get crazy with this. What if, in a year, the people that we turn it over to, are expected to turn it over to somebody else? Rich – Right, very cool. Clayton – Leadership pipeline is the number one thing that limits churches, especially multisite churches, is you’ve got to have people. People, people, people. Clayton – We are officially doing that. We still have a long way to go, we are not the proof text, but as far as large churches, I feel like we may have been one of the first large churches to ever turn the whole weekend over and it went better than we ever could have anticipated. Rich – Yeah, that’s very cool. I love that. Brian Tome’s church in Cincinnati called Crossroads did a similar thing years ago. Now they did it once. It was pretty ingenious, a similar idea, just kind of flushing out to give listeners a different idea. What they did was they invited all their volunteers, they said, “Hey, we’re having a party for you on this upcoming Sunday,” and they invited them but they said, “We need you to come to this different location,” and people arrived at the church and there were no volunteers there. Now they kind of went from almost like the exact opposite, it was like this punitive thing, not punitive but just demonstration, “Look at what would happen if there were no volunteers here.” There was nobody in the parking lot parking cars, there was nobody standing at doors, there was nobody in the kids’ environment, there was no band, there was no lighting, video, they had one light on and Brian Tome was standing on stage and preached this great message and he said, “Listen, there’s nothing going on here without volunteers. If you’re not plugged in as a volunteer, we literally can’t do this mission without you.” At the same time, they threw a party, a volunteer appreciation party, that same Sunday morning at an offsite location, to thank their people. Kind of the inverse, when I heard what you guys did, it was kind of the inverse of what you did, but I just love it, I think that’s just a great tool and a real practical push for staff and I know when I heard that, for my church, I’m like, “I don’t know if we could do it,” but I love it, I love the motivation from that. That’s fantastic. Anything else you want to share before we jump into the rest of the episode? Ben – I think the other thing that I would tell you is since that Sunday just some things have happened. We have our tech director now that he’s got over 50% of his volunteers that are cross-trained, to be able to do multiple jobs in the tech ministry and he was probably a guy that gave us the most pushback on this whole idea, that he couldn’t let go the soundboard, he couldn’t let go the switcher, the cameras or whatever and he’s probably our biggest cheerleader in that now, from the standpoint of, he’s living it. I mean, you look back at our children’s ministry and you don’t see our children’s minister is the one delivering the message every week. It has literally, kind of turned the lightbulb on for people to give ministry away.